Warning. The following publications may induce intense reasoning. 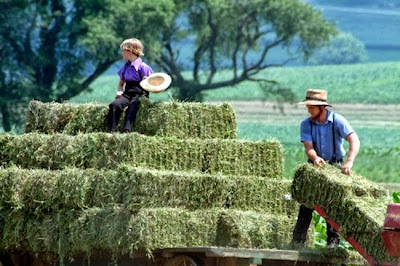 I would like to take this opportunity, and try to learn from the Amish, about social organization and human nature. I find it interesting that small communities can have very specific rules, but still be enjoyable to their members. Even now, people choose to enter (and leave) the Amish communities, and other such similar close-knit and strict groups, around the world. Is it possible that the best way for people to organize is in an array of different strict small communities? The idea that we should all have almost no social rules in our free lives, and that we should all live together in great cities, might not be the best direction for us. Since the dawn of time, people have lived in small and very organized communities. Occasionally, some would change communities and move about. Often, it was due to a marriage or a great need, but sometimes even due to disagreements and conflict. I wonder if in a truly free world, would people just return to this most basic and simple method? Small groups with very strict local rules that immigrate and exchange with other such-like groups, in other places. Constructive, thought-out, and finely argued comments are encouraged. As an author, everything I write is meant to be useful to you, my readers & listeners. Your funding will help me improve the quality of the blog, research, and the equipment I use. Please enable advertisements for this site, so I can get funded and my work is promoted. Share me on your wall! Pin for your friends to see! Why Do We Hate The Rich? How Do Bullies Rule Society? 2012 - 2018 Designed & Scripted by James Koss. Powered by Blogger.